Dentistry for the 21st Century offers many ways to maintain your present smile or to create a dazzling new one! Cosmetic Dentistry involves metal-free techniques to turn an average smile into a truly beautiful one of bright teeth free from any gaps or worn or crooked teeth. It’s what we call a “Hollywood Smile”. Esthetic Dentistry is much the same, but concentrates on making nice-looking dental restorations that look natural in your mouth. Dr. Carroll has many years of experience in creating beautiful, winning smiles! If you just want the teeth to look brighter, home bleaching is an excellent choice. We have found that quick-fix bleaching, done in an hour or so, doesn’t work well. Results may look good initially, but the teeth soon revert to their original color. In our office, we construct custom “bleaching trays” that you will use at home to hold a special bleaching paste against your teeth for several hours a day. You continue this daily home bleaching for several weeks. We have found that this method provides the best, longest-lasting result. Home bleaching is the least expensive way to brighten the smile. It is essentially painless (in some cases, the teeth and gums become more sensitive during the bleaching period). You can whiten all your teeth at once. No permanent changes are made, except that the teeth will be whiter. If the teeth loose their brightness with time, it’s easy to bleach some more by acquiring fresh bleaching paste to use in the custom bleaching trays you will already have. Some people don’t enjoy having to wear the bleaching trays religiously for several hours a day, for several weeks. Some people don’t like the sensitivity that occasionally occurs during the bleaching period (any sensitivity disappears when you quit bleaching your teeth). Bleaching can brighten your teeth, but will do nothing to improve the shape of the teeth (lengthening, closing spaces, making them look straighter, etc.). Some people’s teeth don’t bleach as much as others. It’s a bit unpredictable. 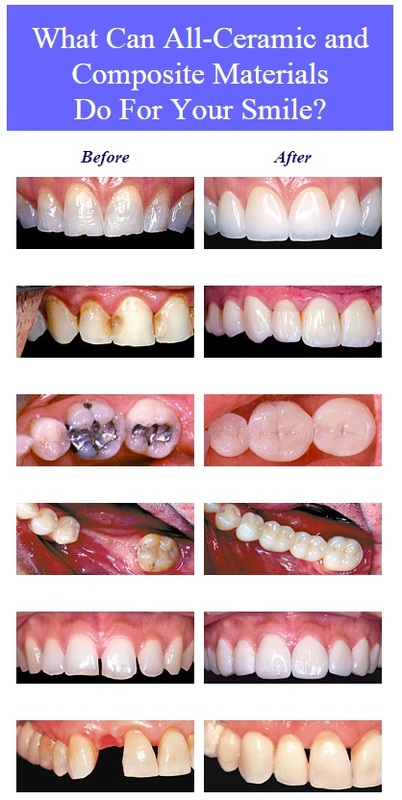 Composite bonding is a very versatile way of improving the smile. A tooth-colored resin (plastic) is applied to the fronts of the teeth, hiding the natural tooth underneath. By using a resin that is whiter than the natural tooth, we can make the tooth look brighter. By over-contouring the resin, we can make a tooth appear wider, closing spaces and making the tooth have a more pleasing shape and alignment. Bonding is fast. We can apply resin to many teeth at one sitting. Since composite resin bonds to itself, it’s easy to repair and modify later. Composite bonding is less expensive than porcelain veneers or crowns. Plastic is not as strong or color stable as porcelain. After a year or so the plastic usually has a few rough edges. Occasionally there is some surface staining. Both these problems are fairly easy to deal with, since new composite can be applied as needed. But the occasional need for repairs is an undesirable trait of composite. While composite works fine for widening teeth (to close gaps), it is difficult to successfully lengthen teeth with composite. This is because the weakness of plastic makes it break if the biting forces are too strong. While composite bonding looks pretty good, it is not as beautiful and natural-looking as porcelain. Porcelain is the finest material available for cosmetic dentistry. As far as looks and long-term function, nothing else matches porcelain. Porcelain is the strongest tooth-colored material we have. Its strength frequently allows it to hold up for a lifetime on the biting edge of the front teeth. We can lengthen worn-down or uneven teeth with porcelain, making them line up more perfectly. Porcelain is the most beautiful, lifelike material available for use on teeth. We have very good color control with porcelain. You can select the amount of brightness desired from a large selection of available shades. So it’s easy to make the teeth look just like you want them look. If your teeth are very dark, porcelain can successfully hide the darkness better than composite. While composite bonding is done in the mouth, right on the teeth, porcelain veneers and crowns are constructed in the dental laboratory on a plaster model. Since the model is easier to work on, and time is not a factor, porcelain work are generally more perfectly shaped and more beautiful than composite resin shaped right in the mouth. Porcelain veneers and crowns take two appointments to make. At the first appointment, the teeth are prepared to receive the porcelain. To make room for the porcelain, some enamel is removed from the teeth. At the second appointment (about two weeks later) the porcelain is bonded to the teeth. When we make porcelain crowns, we also make temporary plastic crowns to cover the teeth during the two-week porcelain construction phase. But when we make veneers, characteristics of the technique prevent us from making temporary veneers for you to wear. Since some enamel is removed at the first appointment, teeth receiving veneers will temporarily look a bit smaller, feel rougher on the front, and be more sensitive than normal for the two week period during which the veneers are being constructed. Porcelain work costs more than bleaching or bonding. With all the options available in modern cosmetic dentistry, we can achieve very positive results for your smile. Please give us a call if you have any questions. We’re here at your service! The cost of cosmetic dentistry is often a hurdle to overcome in obtaining a beautiful smile. Cosmetic dentistry is an elective procedure. This is something you do for yourself, not because you have to, but because you want to. It’s like buying new clothes to make yourself look nice, thought you know your old clothes are still serviceable. It’s like buying a new car when your old one, though dated, dented and distressed-looking, will still get you to work okay. It’s unlikely that dental insurance will pay much for cosmetic procedures. Sometimes, if your front teeth are chipped, or large fillings are present in them, we can get some insurance coverage on the work. But in most cases the insurance company won’t pay for cosmetic dentistry any more than they would pay for a facelift or other elective plastic surgical procedure. There are several ways to pay for the cosmetic dental services you want. Some people pay as they go, getting a few teeth done at a time as they can afford it. Others set up a payment plan with us so they can get all their work done now, then pay it off over time. Our office staff is ready to work with you to create the payment system that will work best in your particular case.